To make the homemade marshmallows: Watch me make the marshmallows in my instagram video. 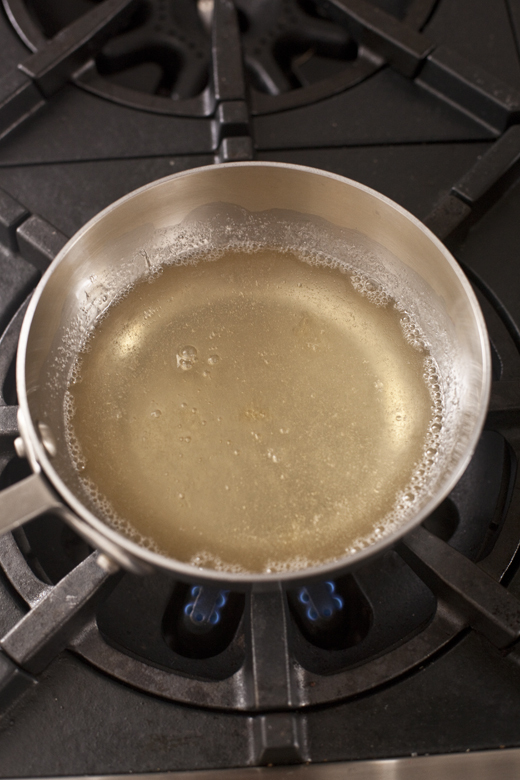 Once the gelatin has softened, squeeze some of the excess water out. 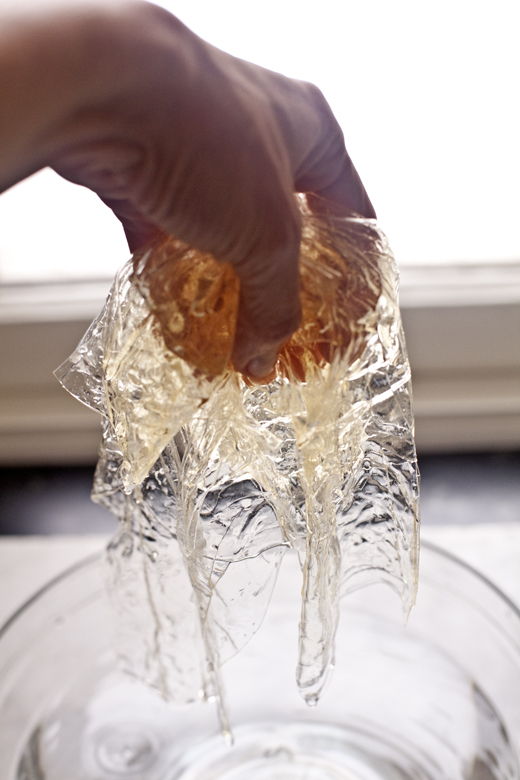 Melt the sheet gelatin over low heat, stirring once in a while, until totally melted. Turn off the heat and leave in the pan until ready to use. pour the melted gelatin sheets into your mixer. Turn the mixer on low-speed and carefully pour in the hot sugar syrup along the side of the bowl, being careful that it doesn’t hit the whip attachment. Once you have all the syrup in the bowl, add the salt, turn the speed up to high and let it mix for about 10 to 12 minutes. Generously dust a baking sheet, lined with parchment, with powdered sugar. The marshmallow will be light, fluffy and cooled to nearly room temperature. This is when you add the vanilla, extract and food coloring. This recipe is just a combination of sugars and gelatin—simple as that. You can keep the marshmallows pure or play with flavored extracts and fun colors. They store for weeks in a dry spot. 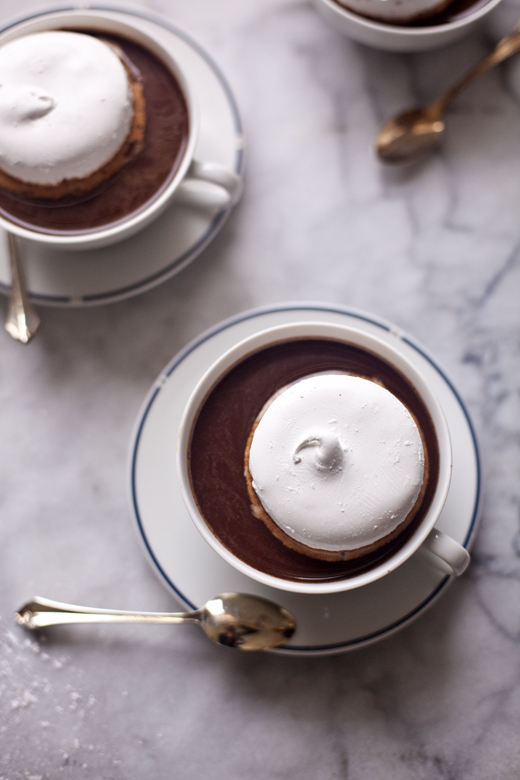 Anytime you come home after braving the cold, just make up some hot cocoa and float a bit of happiness on top. 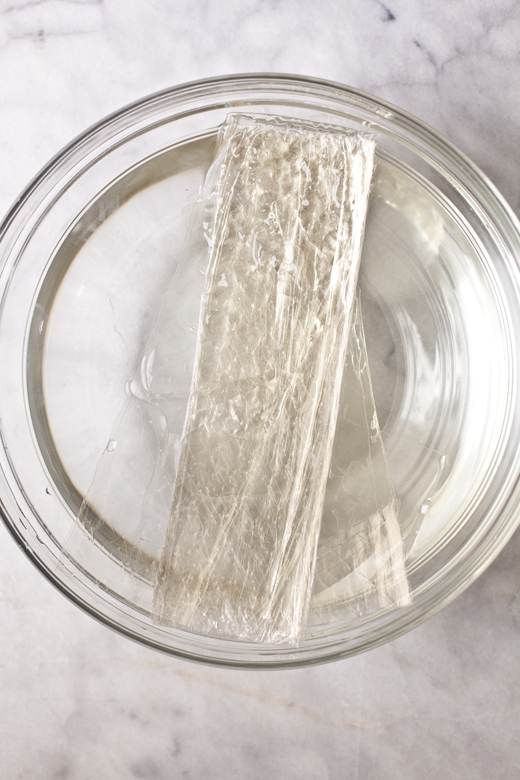 Submerge the gelatin sheets in a large bowl of water. 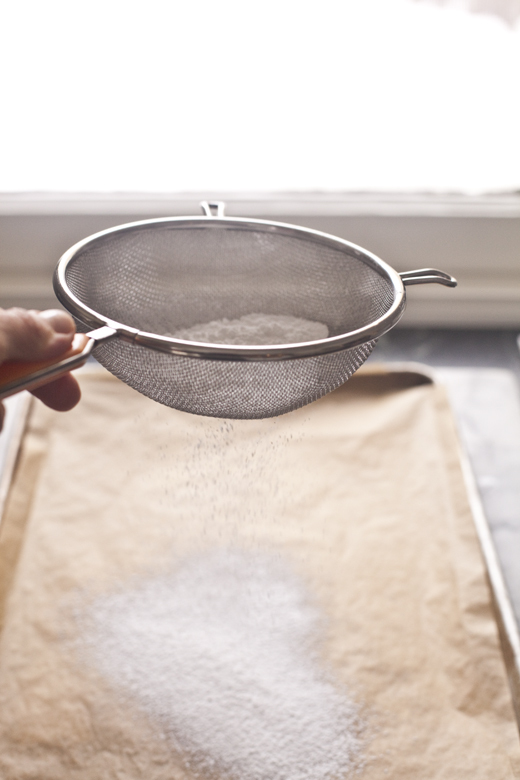 (If you are using the powder gelatin, dissolve the 3 packets in ½ cup of water in the bowl of your stand mixer.) 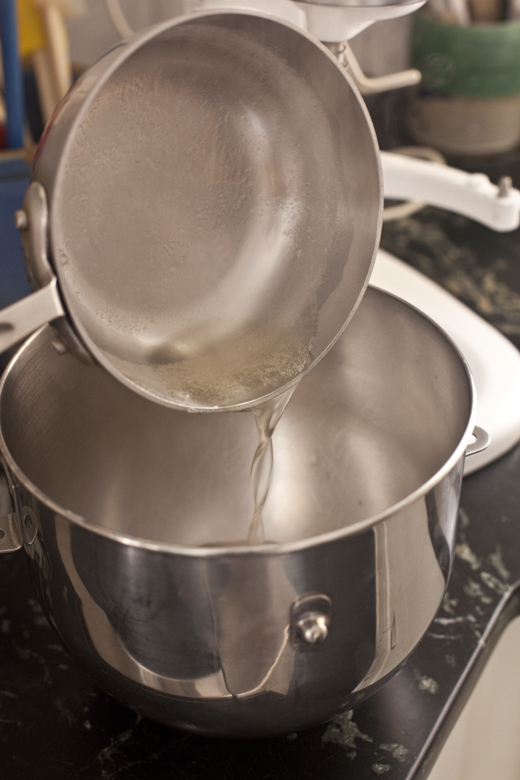 Once the gelatin has softened, squeeze some of the excess water out. Place it in a small saucepan. 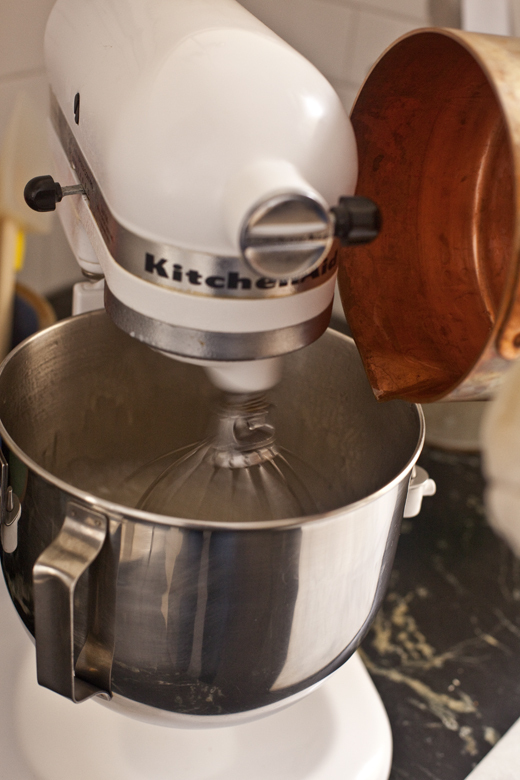 (If using the powdered, just leave it in the bowl of the stand mixer, no need to melt it.) 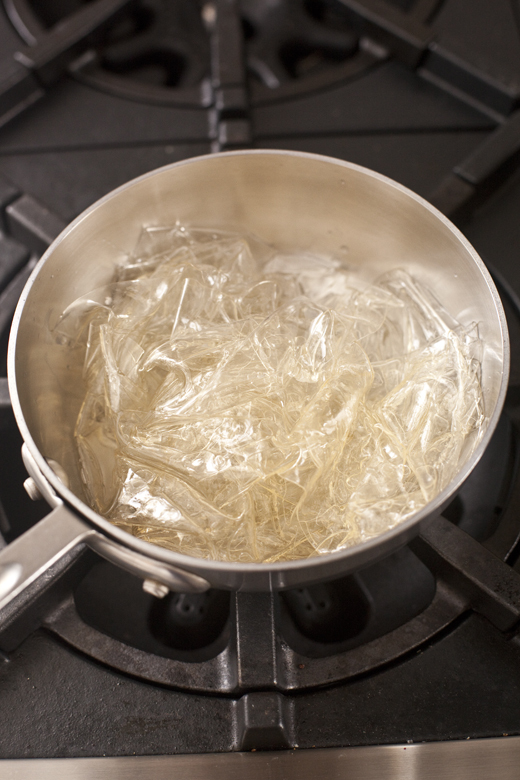 Melt the sheet gelatin over low heat, stirring once in a while, until totally melted. 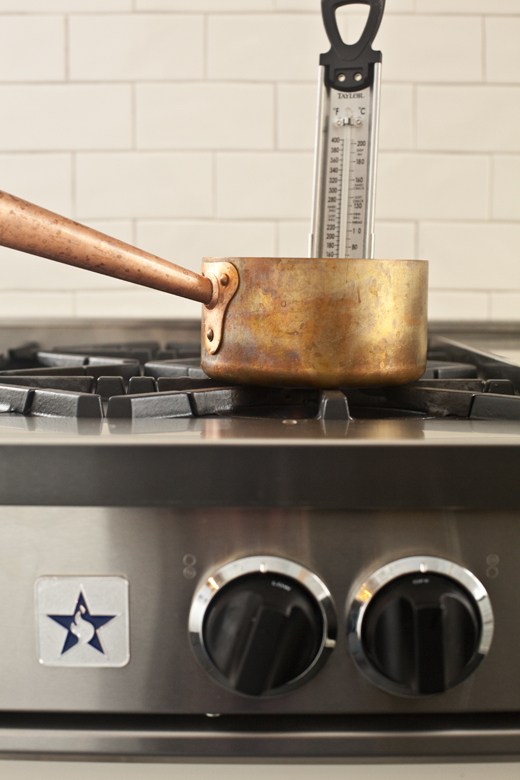 Turn off the heat and leave in the pan until ready to use. 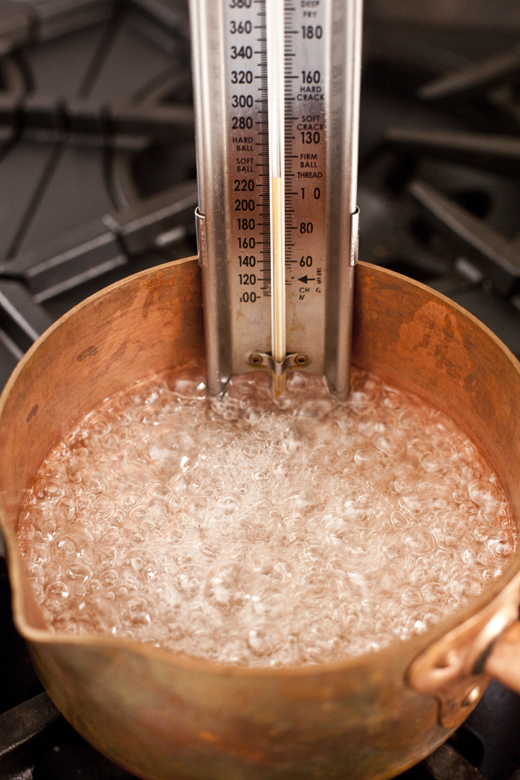 In a second saucepan cook the sugar, corn syrup and ½ cup water, until it reads 245°F on a candy thermometer. 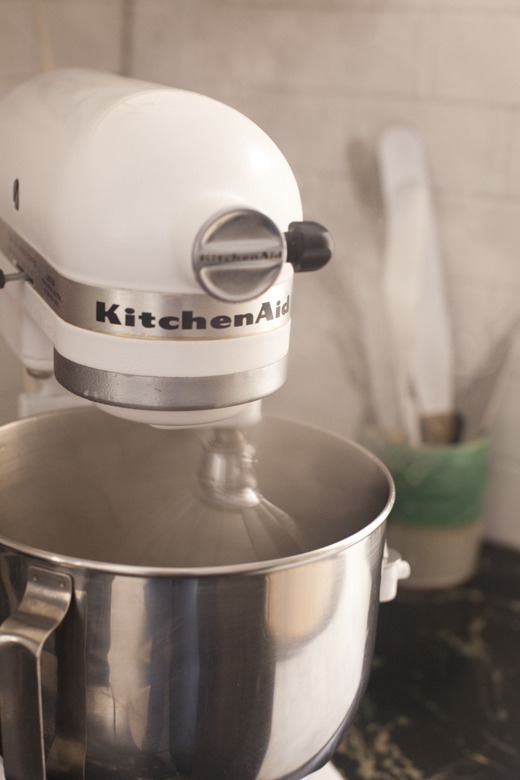 Turn off the heat and quickly pour the melted gelatin sheets into your mixer. Turn the mixer on low-speed and carefully pour in the hot sugar syrup along the side of the bowl, being careful that it doesn't hit the whip attachment. 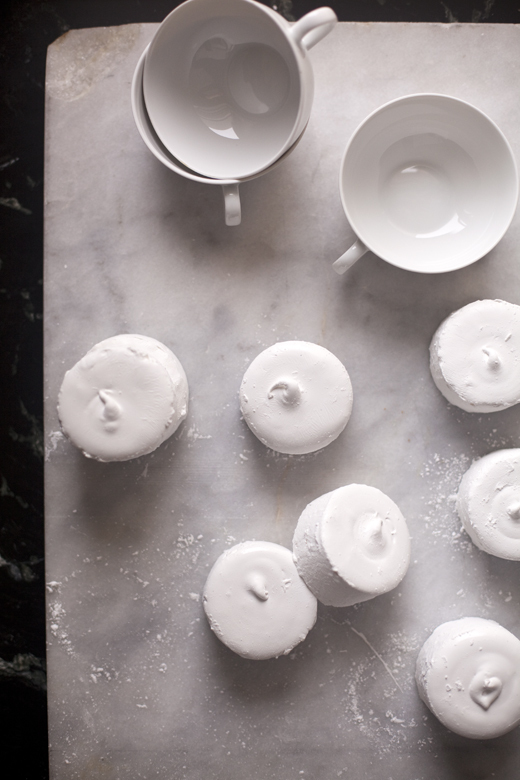 Round Marshmallows: To make round marshmallows I used 2½-inch molds. Line the molds with acetate strips that are cut to fit and really lightly wiped with butter, then dusted with more powdered sugar. This requires a bit more effort than the square or freeform marshmallows. Using a pastry bag (I suggest using disposable, since it is very tough to refill the bags when working with sticky marshmallow) fitted with a large round tip. Pipe the marshmallow evenly into 12 prepared forms. 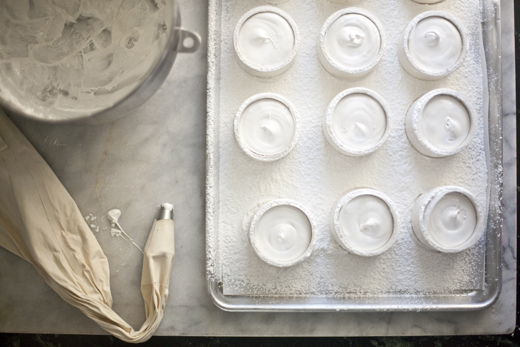 Allow the marshmallows to sit for several hours, or overnight before unmolding them. Square Marshmallows: If you want to make square marshmallows, just lightly grease a baking dish with butter. Pour the marshmallow into the pan and allow to sit for several hours or overnight. To cut, dust the marshmallows and work surface generously with powdered sugar. Butter the blade of a knife and cut into desired shape. Dust with more sugar to prevent from sticking. 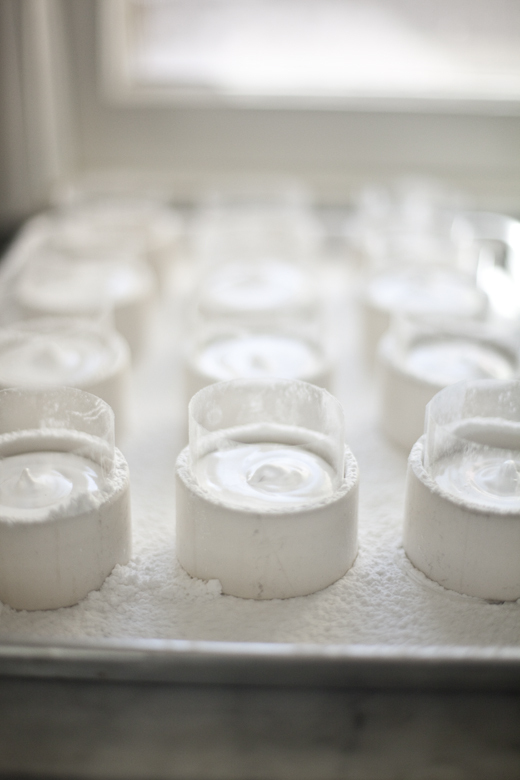 The marshmallows will hold their shape and can be stored in an airtight container for a week. You want to make sure they are well coated with powdered sugar or they will stick together. 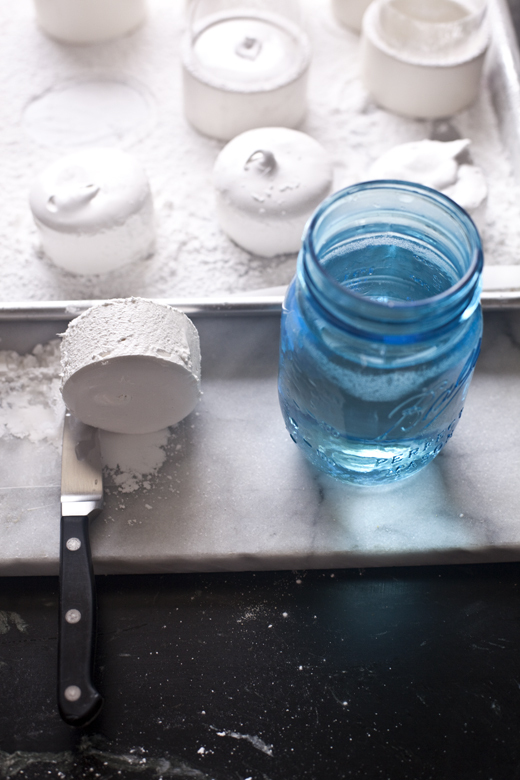 Round Marshmallows: To make round marshmallows I used 2 1/2-inch molds made from PVC pipes. (I had them cut to the size I wanted from a long pipe that you can get at Home Depot. Or, you can buy pastry molds.) Line the molds with acetate strips that are cut to fit and really lightly wiped with butter, then dusted with more powdered sugar. This requires a bit more effort than the square or freeform marshmallows that I’ll talk about in a minute. Using a pastry bag (I suggest using disposable, since it is very tough to refill the bags when working with sticky marshmallow) fitted with a large round tip. Pipe the marshmallow evenly into 12 prepared forms. 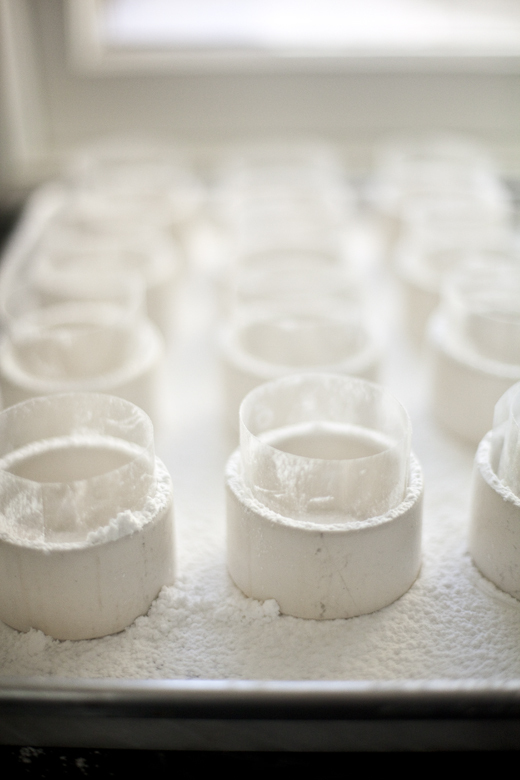 Allow the marshmallows to sit for several hours, or overnight before unmolding them. 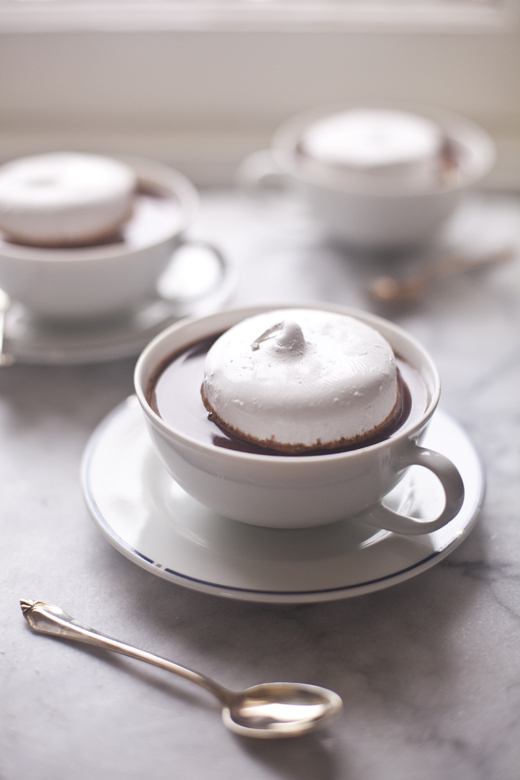 Make your favorite hot chocolate recipe and float the marshmallows. As they sit in the hot liquid they will begin to melt, that’s the best part! Great photos and instructions! I love the free form marshmallows that you made too. Very nice post. I can’t wait to try my own!! Any substitutions if you’re avoiding corn syrup? I have always used corn syrup, so I will have to do some investigating to see if there is a reasonable substitute. You make it look so easy! I’m going to try it. These look beautiful! Sheet gelatin seems to come in varying strengths – can you please comment, so we can find the correct kind of sheet gelatin? Thank you! Great question, I used silver sheets. they are really beautiful. like puffs of snow. These are just gorgeous and look like so much fun to make! They really are fun to make. Sooo many options for flavors, shapes and colors! In place of the corn syrup, I have used Lyle’s Golden Syrup, sorghum syrup, and honey all with success. The sorghum will tint the marshmallows a very light doe brown. Hope that helps! I have used honey to flavor them in the past, but not in place of all the corn syrup. I was thinking Lyle’s would be a great alternative and so tasty. I am going to try it myself! This is amazing. I love it all the way through. These looks great. I really appreciate the photo tutorial. You make it look so easy. I can’t wait to give them a try. Thanks. 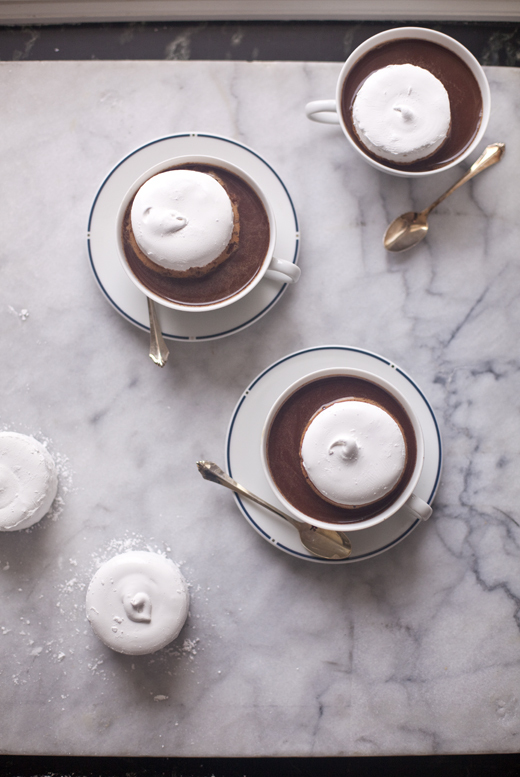 Now those are marshmallows worthy of a hot chocolate dip. I have never made marshmallows and had no idea how to go about it. Thanks for the step-by-step. So helpful. Will you also share your hot chocolate recipe? It looks so luscious in the photographs! these are just the cutest! i sort of want to have a big hot tub sized cup of hot chocolate and sit on a marshmallow raft. and YAY for the (perfect for hot chocolate) weather!!! Thank you so much! 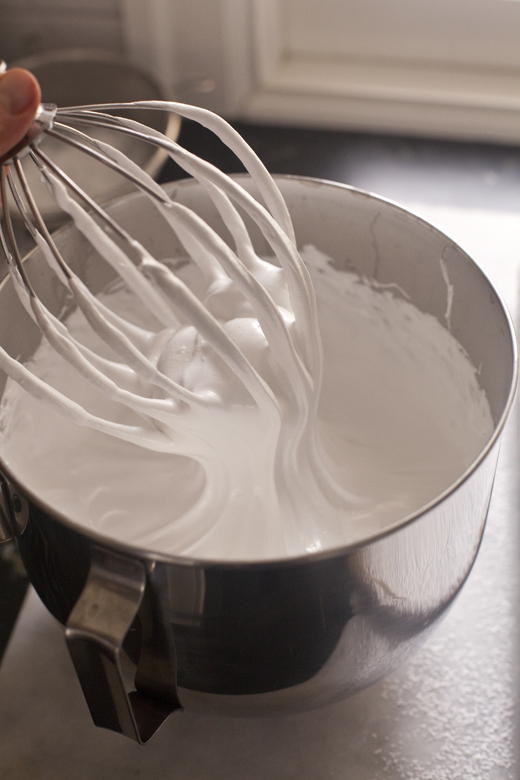 I thought the only way to make homemade marshmallows was with egg whites. I used to make them before I had kids, and always thought it would be so much fun to make them with my future kids — but my kid is allergic to eggs! We will definitely try this together. Zoe – we (husband and I) have purchased the newest (revised) book you co-authored with Jeff Hertzberg (my husband had purchased the first one before we met). I’ve just finished my first try of the basic dough – and baked off a loaf. Everything functioned as indicated it would – BUT – the crust look fine but was actually ‘soft’ and not crisp as I expected it to be. All preparations and instructions prior to baking-off were carefully followed but again the crust looked fine but was quite soft. Is this the way it is supposed to turn out? because in reading back through the book and instructions nothing is actually mentioned that I could find describing how the crust was supposed to turn out. Suggestions? Don’t think another 10 minutes baking time, etc., would have made much different – but if so please advise. Also, I’ve heard that ‘misting’ the top with water just before putting into the oven (and a tray of water was in the oven as the loaf baked) will make the crust turn out more crisp – so if that’s a step that can/should be taken to accomplish the desired crust please also comment. It sounds like your loaf was slightly underbaked, so the internal moisture made the crust soft. Additional baking time will help. THANKS FOR THE RECIPE! WE ALL REMEMBER THE HOT CHOCOLATE WITH MARSHMALLOWS IN IT WHEN COMING IN FROM THE SNOW!! 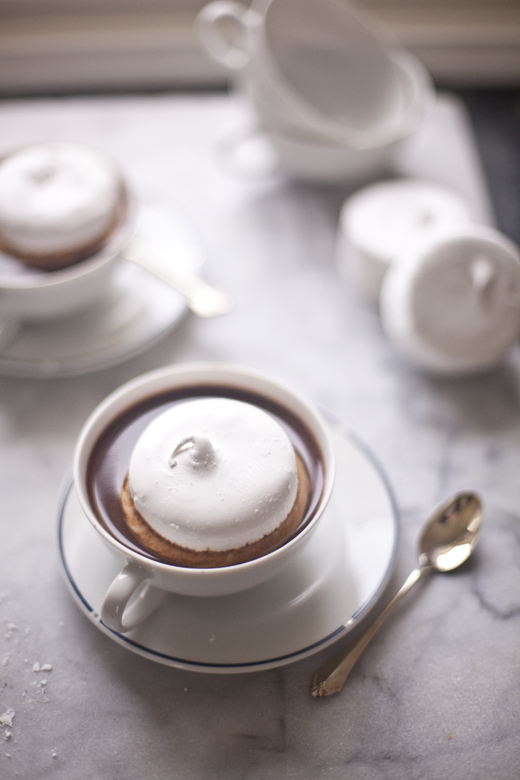 I just found your website via a Pinterest pin of these beautiful marshmallows…it is beautiful. In exploring I notice you have a Bluestar range…I am about to buy one I think…would you recommend? Am interested to hear thoughts if you don’t mind. Am possibly buying two one for farm kitchen (36″ RCS) and one for home (48″). They look sound/great but not that many here on East coast. Thanks so much. I’ve made many, many marshmallows in my day (over 1000 for my daughter’s wedding)… but they never looked like these. Yours are beautiful! I’ve just made marshmallows for the first time and you post was soooooo helpful. I had a recipie from a different site but I managed to mess up my first batch. Your pictures of the steps ensured my next batch was successful. So thanks. Do you have an alternative suggestion for gelatin? My husband can’t eat it! I would love to try this recipe with him. Hi. I’m sorry I missed this, but did you ask me on instagram? I have never tried them without gelatin, but I know it is possible. I did ask on instagram! Still looking for a gelatin alternative. Hi. I think the best bet is agar agar, but I am just not sure how much. There are many vegan recipes online, but since I haven’t tried them, I am not sure which to recommend. I hope you give them a try, so easy and fun! I love this shape, but it’s a tiny more work to get there than the giant squares. These look so good! Is the 1 cup of powdered sugar just for dusting or does that go in the pot of sugar and syrup on the stove? Hi. It is just for dusting! How could I make these mini? Just spread them out in a larger pan, so they are much thinner and then cut them into tiny pieces. I feel a new project coming on- how heavy are the rings used for forming- how much weight is needed for the form, was thinking simple form cookie cutters sprayed w/ cooking spray.